The Train Ride From Ft Riley KS. Company C, 709th Maintenance Bn. The Vietnam War was the source of great dissention among many in the United States – many were supportive of the war efforts, while others were very much against the efforts. Some things that divided years ago still exist among many today, especially the baby-boomers who were coming of age during the Vietnam era. In contrast to that divide, however, is a brotherhood among thousands across the country – a brotherhood that exists because of their direct involvement in the Vietnam War. As a veteran of the Vietnam War, I am a part of that brotherhood, but was unaware that it existed to the extent that it does until I got fully involved in my search for those with whom I served. My search began as a result of the questions that came from my daughters about my involvement while serving in-country. Before getting into that, however, allow me to briefly review my military service. I had decreased the number of hours I was attending college and it was not long before I received that dreaded letter from the draft board – I was to report to the local draft board office for transport to basic training. My basic training was at Fort Knox, Kentucky. Basic training is followed by AIT – Advanced Infantry Training. This is when soldiers are trained for the job they would do throughout their military careers. I was scheduled to attend auto mechanic school, which was totally out of line since I had no interest in working on vehicles. I requested training as a medic, but ended up getting no AIT. I was ordered to report to Fort Riley, Kansas, Company C, 709th Maintenance Bn., 9th Infantry Division. I was one of the first to report since the unit was being reactivated at the time. I was assigned to be the temporary company clerk. Eventually, I was assigned to be the unit supply clerk, the position I held until about six weeks prior to leaving the military. I married my wife about 2 months after arriving at Fort Riley and we lived in an apartment off base. Not long after that, it became quite apparent that our division was preparing for departure to Vietnam. At the time, it didn’t mean a whole lot to me – a young soldier scheduled to spend two years in the military to meet my obligations. 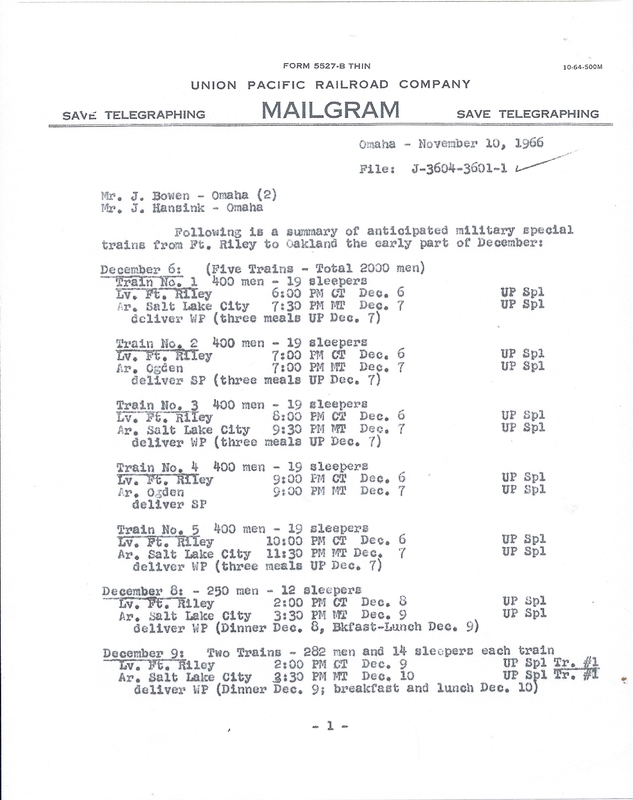 The orders finally were received indicating a departure in December, 1966. I took my wife back to our home, spent time with family, and then reported back to Fort Riley. 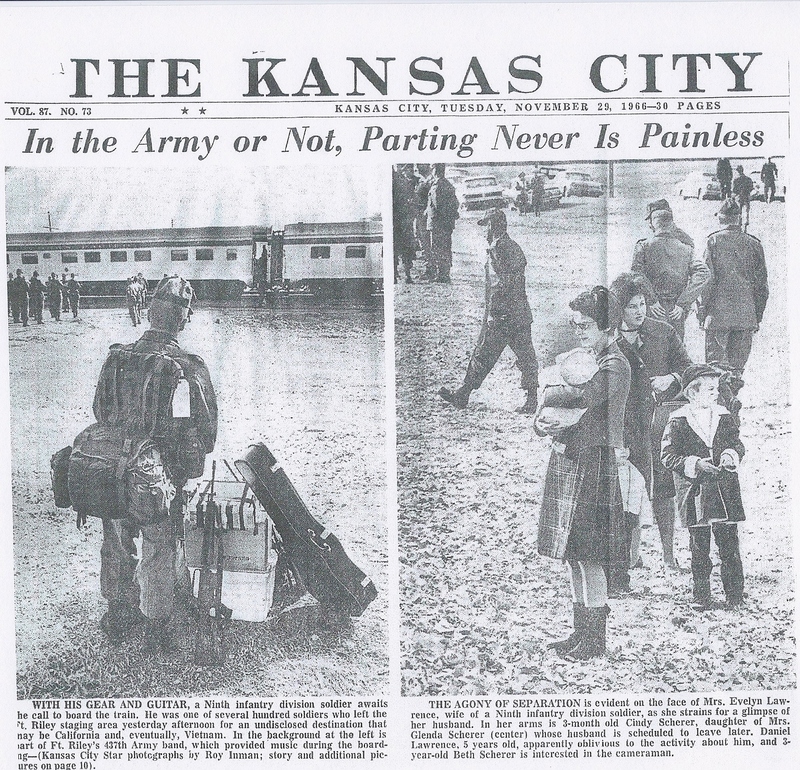 The unit departed from Fort Riley on December 12, 1966, by train. The train was loaded with the troops and equipment. We were headed to Oakland, California, where we loaded on to the USS Upshur. I remember that I was impressed that I had my own roomette on the Pullman car, where someone turned down my bed at night and made it in the morning. Dining was great in the dining car – very good food served on real plates. I remember going through several small towns, slowing down for the crossings. At some crossings there were well-wishers, while at others there were protesters. It was all pretty confusing at the time. The ride across the Pacific Ocean was long and not something that any of the men who took the trip wanted to repeat. Many suffered from being seasick – some for short periods of time and others for the duration of the trip. I remember being seasick for just one day and then I was able to “enjoy” the rest of the trip. The ship landed at VungTau Harbor on January 1, 1967. From there we took a convoy to BearCat, the base camp for our unit. It was a dusty, dirty, hot aggregation of tents, wooden structures, and men. During the next ten months I served as the unit supply clerk. We moved with the unit that was being supported, often spending days and weeks in the field. I remember living out of the back of a 4X4, a large truck used to carry some of the supplies needed by the troops. Many times the meals were C-rations. Those meals were followed by good food cooked by an outstanding mess sergeant and great cooks. One of the cooks, Steve, was one man that I connected with and appreciated his skills in outdoor living. While never having to fire my rifle in combat, I got close enough to see the ravages of this war. I saw tanks and personnel carriers that had been severely damaged by land mines, heard the artillery at night, and saw the holes from the bombs. There were many other men with whom I served – Sgt. Harold, the supply sergeant; Sgt. Radford, a shop foreman and one of the older men in the unit; Jerry, the shop clerk was from Texas; Jim, the company clerk; Frank, from the East Coast; and others from all over the US. The officers were good leaders, but not individuals with whom I spent much time. They were the shop officers and the commanding officer, Major Frank. I was eventually transferred to another unit where my job was to make ice cream! We made the ice cream and it was distributed to the units stationed at BearCat. There were a couple of times when I actually took the ice cream out to the combat units in the field. We took a helicopter to deliver it to the field. I received my orders to leave Vietnam in late November, 1967 and it did not take long to pull my things together to leave. I arrived in the United States, flew on to my hometown and was greeted by my wife and parents. At that time I had served my obligatory two years of active duty. I quickly found a job, went back to school, and started to raise a family. I did not think about my Vietnam experience much after that, until just recently. As I indicated earlier, my renewed interest began with some questions from my daughters. I tried to answer their questions, but soon realized that I had placed a lot of those memories into an unreachable place. I began to do some internet searches about Vietnam, but didn’t find anything specific to my experience. I finally did a search specifically for my unit and found several sites. While viewing several pictures that had been downloaded from others in the unit, I actually found a picture of me, taken in 1967 as I was standing outside of a tent. That suddenly made the experience more real than it had been in over 40 years – I had to do more! I had to find some of the men with whom I served, I had to retrace my journey, and I had to learn about the war that I experienced. As a result of the Lilly Endowment Grant, I was able to do much of this. Return to Fort Riley, Kansas – One of the goals of my study was to revisit Fort Riley, Kansas, where the 9th Infantry Division was being reactivated. I returned to Fort Riley to find that everything had changed. All of the wooden buildings and barracks had been replaced by more permanent brick buildings, apartments, and traditional looking homes. I was able to find Camp Funston, the area of Fort Riley where Company C started organizing. While we were in the area, my wife and I were able to find the apartment that we lived in for the first five months of our married life. We recognized it immediately, since so little had changed. We also found the Methodist Church that we attended and Tuttle Creek, the recreation area where we spent many weekends. We could not find the old ice cream store that we visited at the end of the month, just before payday. If we had two nickels between us at the end of the month, we treated ourselves to an ice cream cone each. We didn’t realize that we were poor at the time! It was interesting to find the railroad tracks leading away from the fort – the same tracks that we used as we deployed to Vietnam. Goal one was achieved! The Train Trip West – Another goal of the grant was to retrace the route followed by the train as we headed west for deployment. I requested information from Amtrak about any records they might have about the route followed only to find out that Amtrak did not even exist at the time. In 1966 the Union Pacific served the routes from that area and west. After looking at the current routes used by Amtrak today, I determined that the California Zephyr route was the closest possible route. After additional internet research I was able to determine that this must be the route followed. 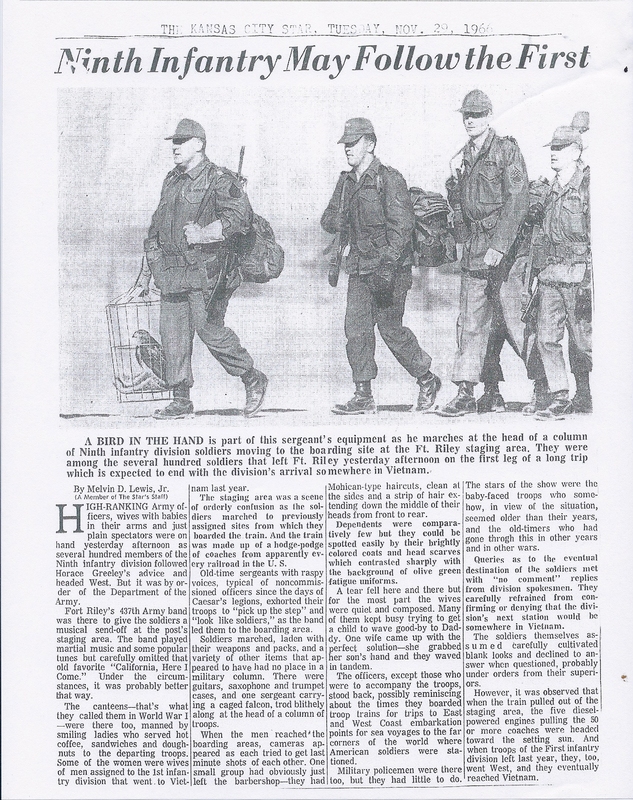 I found a piece written by another soldier who had been stationed at Fort Riley who wrote about his recollections of his trip a month earlier than the trip my unit made. He mentioned many of the towns on the California Zephyr route. This told me that I had the correct route. I was not able to take the train directly from Fort Riley since no passenger service is available on that spur. It was further confirmed to me that this was the correct when, after talking to many railroad employees, I found that the tracks used by Amtrak’s California Zephyr were actually owned by Union Pacific. As soon as I boarded the train, a flood of memories about the ride started coming back to me. But, even as those memories started returning, it seemed much different than I had remembered. 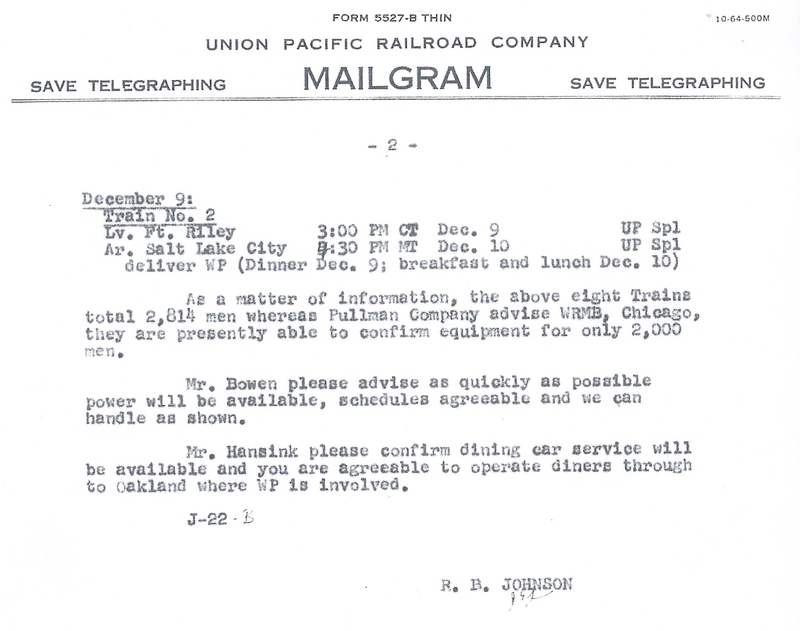 I didn’t recall the Pullman car being as large as the sleeper car that we were in now. It was not until later when I was able to see one of the old Pullman cars next to the current, more modern cars, that I saw how much smaller the Pullman cars were! As I sat in the coach cars I could remember the men sitting in the aisles and leaning over the seats playing poker. In the evening, when the Porter came by to turn down my bed, I recalled how impressed I was as a 20 year old kid who had never done any travelling that someone actually did this for me. The dining experience brought memories of the meals in the dining cars – served by waiters – on stoneware plates. I can recall that the food was very tasty. On this recent trip I found, again, that the food was quite good. However, it was disappointing to find that all meals were being served on disposable plastic. Modern is not necessarily better! I did find that on one of the routes on the return trip they did use real dinner ware. After I shared this story with the Porter and asked where I could purchase one of the Amtrak coffee cups, I found that they were not available. Mysteriously, one showed up in my roomette later that day! Now, I have a constant reminder of my Amtrak experience! I enjoyed the scenery as the train passed through the small towns and the rural countryside. I do remember that much of our travel on the troop train was at night, preventing the viewing of the scenery. Goal two, following the route of the troop train, has been achieved! Visiting Vietnam Memorials – Goal number three for this grant activity was to visit several Vietnam memorials across the U.S. I was able to visit several memorials. I visited two memorials in North Carolina, one in Greensboro and one in Jacksonville. The Jacksonville memorial was in the process of being built, but had the markings of being a beautiful memorial. It had a fountain at the center surrounded by thick, green-tinted glass panels. Each panel had names etched into the glass. This memorial had the names of all casualties from Vietnam. Unlike The Wall in Washington, DC, the names on these panels were listed in alphabetical order. The Wall has the names listed in the order of their death. I found a soldier who had the same last name as me - Caywood. He was from Spokane, Washington and was just a few months younger that I was at the time of his death. He was in Vietnam at the same time as me. He was not a relative. The memorial in Greensboro was also built in a circular fashion. This one was honoring the 1620 fallen soldiers from North Carolina, with names on brass plaques. According to the information provided, one in fifteen soldiers from North Carolina died in Vietnam. The memorial honoring those who served from Junction City, Kansas was part of a park in the center of this small town just outside of Fort Riley. It included a large granite wall with names listed. It also had the insignia of the various military branches and the Vietnam service medals etched into the granite. There were also memorials to fallen firefighters and police officers, as well as those killed in the most recent wars in the Middle East. The most impressive memorial was in Sacramento, California. It was situated in a vast park adjacent to the state capitol. This memorial was also built in a circular fashion. This memorial was set apart from all others by the brass, life-size figures and reliefs around the circle. One of the figures was of a soldier, sitting and reading a letter from home – you could read the message on the letter! Another figure was that of a POW – his face was hollow and expressionless. There was a large, brass relief map of Vietnam on the ground in front of the main display. It had the names of the provinces, towns, and harbors. I could find the many places my unit had been while in the field. It also had a listing of the names of the 5800 soldiers who died while serving in Vietnam. While looking for the memorial in Columbia Falls, Montana, I came across a home for veterans – something that is not seen much any more. I found one man, not much older than me, sitting alone in his wheelchair. I stopped to ask him if he knew where the Vietnam memorial was located. He was able to give me some general directions. We spent some time talking – I sensed that he didn’t have many visitors with whom to chat. As I drove around this small town, I still had a hard time finding the memorial. Finally, I found a vendor selling hot dogs at the side of the street so I stopped to ask him. He was so excited to talk about the memorial because he was instrumental in getting it built! It is a memorial to the soldiers from this small town who have served in Vietnam and other wars prior to that. His involvement in getting it built was because his father’s name was on the memorial. With each memorial there were certain emotions that began to rise up in me. I could not help but think of the families who have been impacted by the loss of the men whose names appeared on the various memorials - husbands, fathers, sons who would never again be a physical part of these families. There were two questions that kept entering my mind as I walked through the memorials, “Why did I get out of Vietnam alive? What am I supposed to be doing with my life that merits the experience and coming home?” Those questions were actually answered quite clearly to me, but that will come a little later. The Men – As I scrolled through the website that I mentioned earlier, I could distinctly remember the men attached to many of the names I read. Each was a young man in his early 20’s snatched from their life in the states. None wanted to be there, but each did the job assigned to them. They shared the good times – the volleyball games just before the monsoon rains slammed the camp and the evenings in the company club. They protected each other when out in the field supporting the infantry. Then they went home - most never to see each other again. Most returned to their homes and went straight back to work and school. Most did not give much thought to what they had been through over the previous two years. But still, there was that brotherhood of Vietnam veterans to which each belonged. Some of those men have recognized the need to become a more active part of that brotherhood and have started meeting periodically in reunions to share experiences, war stories, and to share the supports that are available to them. I had the opportunity to attend my first reunion of those who served in my unit and others in September, 2009. I wasn’t sure of what to expect. What I found was a group of men who had been through an experience not of their choosing. They come from all walks of life. Most are now retired. My greatest experience during this reunion was to be reunited with my former company commander. It was interesting to hear him talk with some of the other former officers about the time of unit build up and the year in Vietnam. They had a different perspective, in many respects, than I had. I learned things about our time there that I did not know previously. What was most impressive was the sense of pride that the colonel had in his unit while in Vietnam. He spoke with compassion about “his men” and the success of their mission. Two others that I spent time with during the course of that year were Sgt. Radford and Steve, the cook. My wife and I drove to the Florida home of Sgt. Radford, the shop foreman in Vietnam. I did not have much contact with him while in Vietnam, but I do remember that his skills in working on vehicles helped our unit achieve a high rate of success. He also had a great way with his men – he was compassionate and understanding, yet demanding. As I talked with him at his Florida home, I learned that he did not have a high school diploma. However, I did learn that he was a very good mechanic and he had good people skills, which made him ideal for his military job. I learned that, even with his advanced age and in the current times, he was admittedly still racially biased. He shared stories about the year in Vietnam about things of which I was not aware. He spoke with pride about his military service and especially his service in Vietnam. It was good to talk with him! Sgt. Radford died seven months after we talked. I connected with Steve in Oregon, his home. I learned why he was so much at home – he lived a life in the mountains of Oregon. He was a hunter, camper, and, from what I could gather, a loner. I remembered Steve as one of the company cooks. I learned that he went out on mission to retrieve disabled tanks and trucks. I also learned that he was one who did not adjust well when he returned from his overseas service. Two men and two different ways of handling their veteran status. In Conclusion – The Lilly Endowment Teacher Creativity Grant enabled me to explore a period of my life that would have remained closed. It gave me a renewed sense of pride as a veteran and especially as a Vietnam veteran. I have been able to share this sense of pride with my friends and colleagues and also, with fellow veterans. I will continue to investigate and share. It helped me have a better understanding of my movement through the two years I spent in the military and why certain things happened as they did. Earlier I mentioned that as I left each memorial I had two questions that kept entering my mind. As I think about my rich family life and the many experiences I have felt, I can only hope that they have benefitted from my growth as a human being through the Vietnam experience. I found out why I returned from that experience from a visit with two women in late September, 2009 – just after my return from the reunion mentioned earlier. The women were students whom I had taught early in my education career. They had reunited themselves and decided that they wanted to seek out some “old” teachers. My name was high on their list, which took me a little by surprise since I had taught them in early elementary grades. We discussed those years and refreshed each others memories about Bloomingdale School, laughed, and maybe even shed a couple of tears. The follow up email from one of them said it all to me. She shared how she recalled our time together and the impact I had, as a teacher, on her. To quote her, “Thank you Mr. Caywood for being that someone. It’s taken me a few years (30 plus) to come back to tell you, but I wanted you to know I’m grateful for what I learned in your class, not just from a textbook, from the character of the man that taught the class!” I figured out that day the answer to my question, “What am I supposed to be doing with my life that merits the experience and coming home alive?” All of these years I have, hopefully, had a positive impact on my family, friends, and colleagues. This student, many years later, told me that I had a positive impact on her life. With the hundreds and thousands of students with whom I have had contact over the almost 40 years in education, I will assume that there are other stories similar to this student’s story. I have been answering my own question every day through my words and actions. I do believe that the Lord has had a strong hand in the events of those two years and the forty plus years since! Thank you, Lilly Endowment, for this wonderful opportunity.